Nine years as a priest, Fr. Francis Barka-Nado, SMA of Central Africa, shares his life as an “urban missionary priest” in the heart of Pretoria, South Africa. He spent five years in the Republic of Benin before serving three years here. St. Martin de Porres Parish is centrally located in Sunnyside providing convenient accessibility to young students to the several universities: UNISA (the University of South Africa), TUT (Tswane University of Technology) and UP (University of Pretoria). When one comes here to join in the celebration of the Mass, or the many other parish events, one can experience the spirit of the harmonious diversity of the many nations and colors worshipping the Lord. Every Sunday we acknowledge the presence of all new comers and visitors to the Church, which gives a personal dimension to the worshipping community. 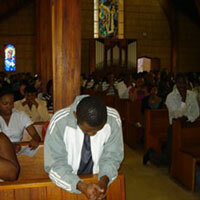 The St. Martin’s choir is renown throughout the Archdiocese of Pretoria. The songs of praise during the Mass are felt in the hearts of all. Living proof of this is the recognizable growth of the parish, truly the hand of God uniting people from all walks of life in the parish community to witness what is proclaimed in the Gospel and the writings of St. Paul. We are one body in Christ Jesus. It is a clear testimony of God’s Love, a sign of our place in the universal body of the Church. 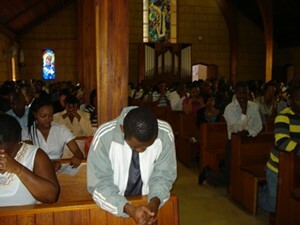 The Church of St. Martin de Porres, located in the heart of ‘the city of a thousand and one flats’, Sunnyside, Pretoria, is blessed in its diversities. The first stone of the foundation was laid on the 12th August, 1962, by the late Archbishop Garner, during the apartheid years when Sunnyside was an all white neighborhood. 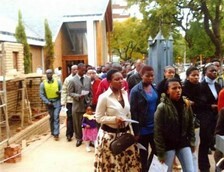 Catholics in South Africa are a minority. Apartheid was not a great supporter of the Roman Catholics. The parish grew to accommodate the various activities. An adjacent parish hall was later built and opened on 28th November 1976, by Archbishop George Francis Daniel. Fifteen years after the collapse of apartheid, St. Martins is still growing! On the 8th November 2008, St. Martin’s opened another extension to the Church, and was again consecrated by Archbishop George Francis Daniel. It was on the Feast of the Dedication to the Lateran Basilica in Rome. St. Martins is growing at an extraordinary speed. Explained by the influx of immigrants and foreign students, from the Democratic Republic of Congo, Côte D’Ivoire, Nigeria and Zimbabwe. There are many who come to have access to the hailed affordable health services. 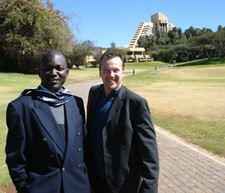 There are also many business people from the African continent making use of the international investment opportunities.